While attention was on Doha for the Diamond League and Monza for Nike’s Breaking2 attempt this weekend, there was plenty of other action. 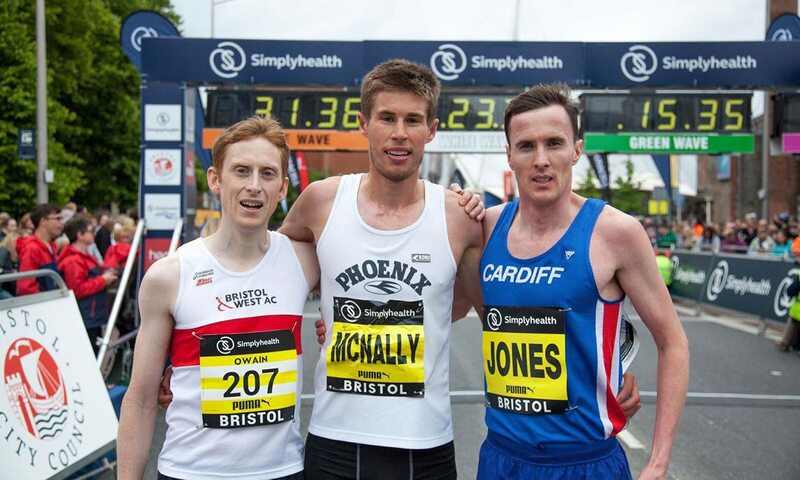 Finn McNally of Brighton Phoenix narrowly won the men’s race in 30:43 from Cardiff’s Carwyn Jones, with Bristol & West AC’s Owain Jones third. Bristol & West AC’s Kate Maltby clearly claimed victory in the women’s race in a PB of 33:29 from Shaftesbury Barnet Harriers’ Rachel Felton and Georgina Schwiening from Cambridge & Coleridge AC. The event, which was first staged in 1989 and joined the Great Run series last year, had over 13,000 runners taking part in 2017. A more in-depth report and photographs will appear in this week’s AW magazine. Reece Prescod, who ran a 10.04 PB last year, clocked a 10.09 (1.2) 100m World Championships qualifier on his season opener. Montell Douglas won the women’s 100m in 11.35 (3.9). Birchfield Harriers (311 points) won a tight match from Newham and Essex Beagles (303), with hosts Sheffield & Dearne (296) a close third. Kyle de Escofet won the 100m into a strong headwind in 10.85 but remarkably that was Birchfield’s only ‘A’ string victory and they achieved their win off a solid all-round team performance. Adam Hague of Sheffield won the pole vault with a 5.30m leap, Zane Duquemin of Shaftesbury won the discus with a 59.20m throw and Newham’s Harry Hughes won the javelin with a 72.03m throw. Shaftesbury’s Seb Rodger clocked a winning time of 50.32 in the 400m hurdles which was the track highlight. Anthony Whiteman ran 1:53.40 for fifth place in the 800m which was a second inside American Saladin Allah’s M45 world outdoor record from 2005 and bettered the British M45 outdoor record by almost four seconds, though it was slower than his indoor mark from earlier in the season. A report and photos will appear in this week’s magazine. The match proved a close affair between Welsh rivals Cardiff and Swansea, with Cardiff winning by two points. Former world championships finalist Brett Morse won the discus easily with a 59.29m throw and also won the shot. Samuel Gordon won the 100m in 10.49. Blackheath’s James Whiteaker won the javelin with a 77.03m PB to take over four metres off his previous best for the longest javelin throw by a British junior since the turn of the century. Hosts Kingston and Poly won a tight match by 10 points from other London-based clubs Herne Hill and Kent AC. The latter’s Jack Green’s 50.27 400m hurdles win was the pick of the performances. Chelmsford narrowly beat Rugby and Northampton in a close run two team battle. Thames Valley Harriers were clear winners from Edinburgh, with Birchfield a close third. Their Irish athlete Ann Marie McGlynn won a 1500m and 3000m double. They also won the 400m through Zoey Clark’s 52.85 clocking. Edinburgh’s junior Alisha Rees won an 11.69/23.78 sprint double. Windsor’s Rachel Wallader produced the top field performance, winning the shot with a 17.08m throw. Crawley surprised Northern rivals Sale and hosts Wigan to easily win the match. Katarina Johnson-Thompson ran a wind-assisted (2.2) 200m of 23.25 and threw 12.85m in the shot put. Jade Jones set a 10,000m PB of 24:15 performance which would have been a world record had it not set in a mixed race. She also retained British titles in the 200m, 400m, 800m, 1500m, and 5000m. Hannah Cockroft clocked her third quickest ever 400m with 59.02 as well as a 17.40 (1.0) 100m, 31.14 in the 200m and 59.02 in the 400m. Kare Adenegan set PBs of 17.97 (1.0) in the 100m and 60.94 in the 400m. Richard Chiassaro clocked a PB of 3:02.49 in the 1500m as well as times of 25.87 for 200m, 47.19 for 400m and 1:34.04 for 800m. Toby Gold set a 100m PB with his winning time of 17.16 (1.5). Rosie Clarke took 15 seconds off her steeplechase PB and set a World Championships qualifier in narrowly winning the race in 9:36.75 to move to sixth on the UK all-time list. Eilish McColgan just missed the world qualifier in the 5000m (15:22) as she ran 15:22.12 in a race won by European champion Sifan Hassan. In the 10,000m, Andy Vernon was inside 28 minutes and Marc Scott and Dewi Griffiths set PBs within 28:20. Rio Olympian Alyson Dixon returned to competition after her London Marathon PB to beat world marathon record-holder Paula Radcliffe by a second in a time of 83:01. Abraham Tewelde won the men’s race in 70:07. Jonathan Taylor won the 10km in 31:03, with Alison Dargie first woman in 38:28. Kristian Jones won the men’s race in 14:31, while junior Annabel Simpson won the women’s race in 16:43. A total of 318 athletes raced under the 20-minute barrier. Masters International winners Chris Greenwood and Clare Elms dominated the race. M40 Greenwood won easily after fighting off a challenge from English Schools international representative Olly Bright and led Kent AC to an easy win. W50 Clare Elms won the women’s race though Kent AC followed up their English Championships win in the London Marathon by defeating Dulwich and Victoria Park, who also made the top four teams in London. NextDo you need more vitamin C?